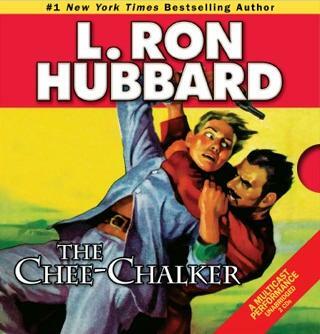 It’s time once again to go on an adventure with the master story teller, L. Ron Hubbard. Once again we turn to the stories from the Golden Age, and this time explore the wilderness and outlaws of the Alaskan territory. Hubbard wrote many stories in many genres that were published in many of the pulp fiction magazines in the mid-20th Century and Galaxy Press has been releasing these stories in their own “pulp” form and have created audio pulps from these releases. What I call audio pulps are short books (usually around 2 hours in length) that are produced with an excellent multi-cast of performers, special effects that place the listener in the middle of the story and original music that matches the story perfectly. Each production is reminiscent of old time radio broadcasts with over the top characters and voices to match. This time I go back to 2008 (the year when Galaxy Audio first began releasing these stories) and listen to the audio pulp of “The Chee-Chalker” which was originally released in “Five Novels” monthly during the months of July and August of 1947. This story takes you to the Alaskan Territory where FBI agent, Bill Norton and his assistant Chick have been sent to investigate the smuggling of Heroin into the United States via Alaska and Canada and the missing agent that preceded him in the territory. Norton is considered at first a “Chee-Chalker,” local slang for a newcomer by the locals, but that’s their first mistake. Norton finds not only the smugglers but a string of corpses which are dismissed as “accidental drownings.” Norton doesn’t buy it and when a dame gets in the picture the twists and turns in clues abound. This time the dame is a heart-stopping heiress to the halibut trade, and seems to be behind the murders and smuggling, at first. 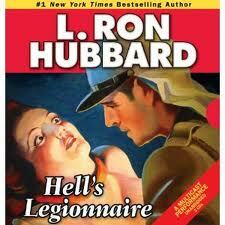 But through the typewriter of L. Ron Hubbard things are never what they seem. With hard hitting punches and excellent detective work, Norton will get to the bottom of it all,but at the expense of whose lives? Yet another fun adventure that will keep you guessing until the very end. Holy cow! I have just finished a super fun action/adventure/comedy and I can’t tell if I’m tired from laughing or the suspense, probably both. “Ai! Pedrito!” is a great romp through the spy world mixing in the United States, the Russians, the Cubans, and the small South American country Colodor . This book is a parody of that spy world mixing up spies, double agents, lovers and enemies as seen through a nerdy very straight edged Naval Intelligence officer and sometimes through his doppleganger, a revolutionary, womanizer and heavy drinker. “Ai! Pedrito!” was originally written as a screenplay by L. Ron Hubbard who said the events were based on an incident that happend to him in real life. The screenplay was then novelized by Kevin J. Anderson. Anderson whose works include the collaboration with Brian Herbert on the “Dune” series of books written and pieced together from material found after Frank Herbert’s death. Anderson is not a stranger to turning “found” material into great books, but most of his stuff is Science-Fiction, while this story has a very small piece of sci-fi to add to the fun, Anderson proved he can also work on comedy and adventure with this one. The Russians and Cubans have developed a plan to steal secrets from the U.S. military by placing a revolutionary, by the name of Pedrito Miraflores into the office of U.S. Naval intelligence and in turn send Lt. J.G. Tom Smith to the small country of Colodor, while Pedrito steals the secrets. What makes this the perfect plan is that Smith and Miraflores are mirror images of each other, in looks only. While Smith spends his spare time reading history books and his drink of choice is milk, Miraflores’ pasttime is womanizing and drinking tequila, oh, and starting revolutions in South America. But these two redheads will be switching places and the mayhem begins. Tom Smith is told he has won a free trip to the beautiful South American country of Colodor. When he tells the representative from the sweepstakes he can’t find Colodor on the map the rep tells him it’s all due to a strike by the Mapmakers Union. Tom takes the vacation as a chance to relax and get his mind away from the numerous blueprints of secret weapons and get a chance to read his book on great Naval battles. When he arrives at the Colodor Airport he is accosted by a man that greets him with, “Ai! Pedrito!” and proceeds to shuffle Tom into the Airport bar insisting on buying him a drink. When Tom insists he’s not Pedrito, the man thinks Pedrito is undercover and says, “Don’t worry Pedrito, your secret is safe with me.” This is how Lt. J.G. begins his life as Pedrito Miraflores. 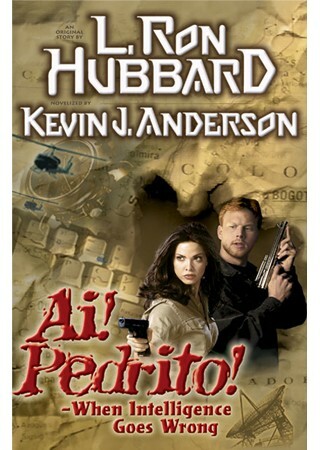 Meanwhile, Pedrito begins stealing secrets and, when Smith’s boss insists Pedrito date his daughter Pedrito cannot resist the chance to be with a beautiful woman. But alas, this begins Pedrito’s demise in America. With each person beginning to absorb the other more and more as they are forced to live as each other until the mission is finished they both begin to realize that womanizing gets you nowhere (especially when the women can think of only getting married). Smith seems to be doing more damage as Pedrito, when he blows up the US Embassy, by proxy, a secret CIA communications center and gets the US to bomb secret Cuban Missile silos. All this is done under the constant watch of a mysterious master of disguise by the name of Bolo. With some funny constant running gags, such as the shout of “Ai! Pedrito!”, Smith nearly recognizing Bolo each time, and the mapmaker’s strike, this book will have you laughing out loud while on the edge of your seat wondering how it all turns out. I will say that not until the very end will you know. Hubbard had a knack for twists in a story and this one, I think, used every twist he could think of. This audio book is yet another superb production from Galaxy Audio. Galaxy Audio has been turning all of Hubbard’s pulp fiction stories into audio books and this latest release shows they are working on more of Hubbard’s works I hope they keep on producing more of these excellent audio dramas, because I can’t wait to listen to some of his sci-fi novels. Galaxy Audio shows how an audiobook should be done, with excellent voice actors, special sound effects that are comparable to any major motion picture. The incidental music through the book and especially between chapters perfectly represent the feel of the audio book, making the entire production a classic work of art. Mixing in a comedy of errors, mistaken identity, espionage, and blundering officials, “Ai! Pedrito!..” is a fun audiobook that will keep you on the edge of your seat with action and laughing out loud with great humor. Once again it’s time to dive into the Golden Age of Stories, when many Americans could get great escapism fiction from pulp magazines. One of the most prolific pulp fiction writers was L. Ron Hubbard, writing stories from many genres and being published in nearly all the pulps. This time around we go on a far flung adventure and join up with the French Foreign legion. I can remember when I was young that a young man would instead of run away and join the circus had the option of running away and joining the Foreign Legion, I think I remember some TV show where a kid threatened to do so but being only 9 years old was talked out of it by his parents. The French Foreign Legion has been known to be an elite force with training that is more intense than any other military allowing anyone from any nationality to serve the French Army. This story, “Hostage to Death” was originally published in “Five Novels Monthly” July, 1935 and is an adventure that will lead to double crosses within double crosses. Legionnaire Officer, Bill Reilly receives a severed hand that serves as a message and a threat. The hand is that of some unlucky soul that crossed into Abd El-Ulad’s territory and that if nothing is done an Englishwoman, Kay MacArthur’s hand will be sent next, basically challenging the Legion to rescue her. Knowing it could be a trap, Reilly’s sense of honor overrides and he sends his squad in to rescue the woman. The good news, the woman is rescued. The bad news, it was a trap and the railroad they were supposed to be guarding is blown up. Reilly is tried and convicted to 15 years for abandoning his post. 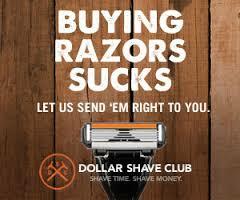 But the Legion has other plans for Reilly. Now that Reilly is known to be sent to the roughest prison in history the Legion plans for his escape so he can infiltrate another enemy’s camp, that of Abd El-Krim. Reilly takes to Krim the plans for movement of ammunition and basically sells Krim several trainloads of Legion weapons. The Legion does this so the enemy can attack and weaken Spain, who is threatening the French. The problem is that the French have one more plan of doublecrossing Reilly which could put him and Kay MacArthur in the path of certain death. 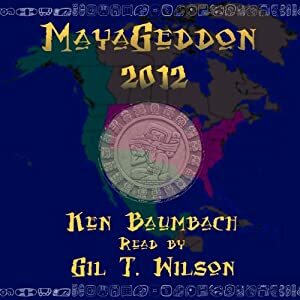 Once again Galaxy Audio productions along with a superb cast present an adventure from the Stories from the Golden Age. The sound effects alone put you in the middle of the fight with rattling machine guns and clashing of blades. You may find yourself ducking the gunshots while trying to rescue the dame while listening. 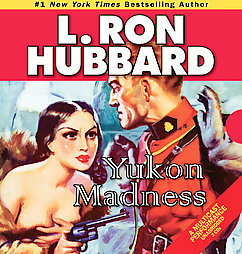 I keep diving into my collection of L. Ron Hubbard stories that have been re-released by Galaxy Press and Galaxy Audio. Back in the days of old (okay, the mid-20th century), writers could make money for about a nickel a word by publishing short stories in the pulps. The pulps were magazines that printed short stories that were printed on cheaper paper to keep the price down to about 5 or 10 cents per issue. The cheaper paper was pulpy and lumpy and the stories from that time are referred to as pulp fiction. Hubbard wrote many stories from this time period, often referred to as the Golden Age of Stories. Galaxy Press and Galaxy Audio are keeping the pulp fiction feel by re-printing these stories in short books that closely resemble the old pulps using the original artwork and keeping the books at 120 pages or so and feature from one to three stories. The cool part is that with the audio books they are creating an audio pulp. 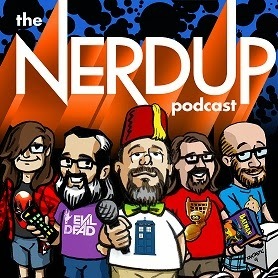 The audio books all come out to be about 2 hours and feature a fully produced (with sound effects) and multi-cast performance that sound like the old radio dramas from around the same time period. “Yukon Madness,” originally published in”Mystery Adventures” Aug 1935, tells of the hunt for Itauk the Madman who has spread death to the Yukon, throwing the bodies of his victims to his sled team of twelve wolves. Tracking him down are Canadian Mountie Tommy McKenna and his partner Simmons. But when the pair separate to hunt for food, Itauk attacks Simmons and lets his wolves make an unmentionable feast that Tommy later discovers on his return to camp. Enraged, Tommy follows the maniac’s trail to a village and en route he meets an enchanting Eskimo woman named Kaja. Of course, the route’s a trap set by Itauk, and the only one who can save Tommy is Kaja, who is engaged to be wed to the ruthless killer, and who plans to serve the Mountie as the next meal for his personal wolf pack. Though wounded, Mounty Tom McKenna uses a ruse to vanquish the rampaging Itauk the Madman, and then leaves him to the wolves. This makes for a fun short story that is over before you know it and just enough time to get your adrenaline up. “The Cossack” was originally published in the May-June, 1935 issue of “Unknown” This one is a sad tale of love lost and betrayal of a leader. Colonel Komroff has caught the eye of the Duchess in revolutionary Russia. The only problem is; Komroff has a woman waiting for him back home. The Duchess could give him everything including advancements in his career. When she offers him an advancement in rank all she asks in return is a kiss. Komroff spurns her advances and she ships him off to a far off post. For months he waits for a letter from his girl back home but not a single one arrives, when finally he receives notice she was poisoned. When he confronts the Duchess and he still rejects her she has him killed before a firing squad. Luckily Komroff has friends and is snuck out of town. Jump ahead some time and the Duchess is driven out into hiding as the country seeks to destroy communism. She sees Komroff fighting in the enemy’s army and in a final confrontation worthy of a great opera the tragedy unfolds. A man short in stature but large in courage, is in charge of a small trading post on the south seas island of Nunahola. When a pirate attempts to take over the man is beaten by the pirate, but continually defies him driving the pirate mad and eventually away from the Island. So, in this short audio book we travel from The Great White North, to Revolutionary Russia to a South Seas Island, some great adventure with tales that range in emotion as they do locale. Once again it’s time to head out on a far flung adventure thanks to the old pulp fiction stories of L. Ron Hubbard. Galaxy Audio and Galaxy Press have been re-releasing all the stories from the Golden Age of Stories when the pulps were a great source of fiction. Many great authors wrote stories that were published in the mid-20th century in magazines that featured short stories pertaining to different genres of fiction. 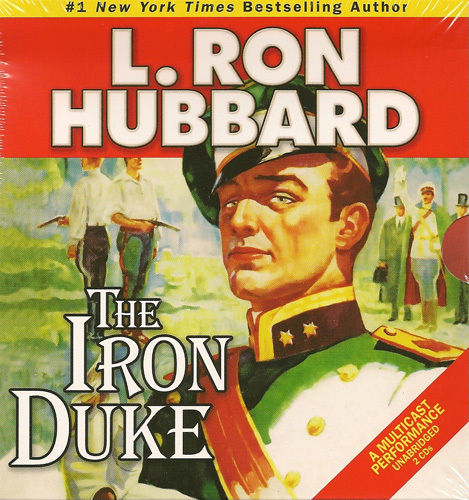 L. Ron Hubbard wrote in many of the genres provided by the pulps, such as Westerns, Air & Sea Adventures, Science-fiction and Fantasy. This time around it’s a far flung adventure to the fictional Balkan kingdom of Aldoria. Originally published July, 1940, this story is set around the time of World War II, is about a renegade who is wanted by nearly every government in Europe. Blackie Lee is not only a wanted man but he’s a doppleganger for the leader of Aldoria. Blackie learns of this “kinship” and devises a plan to escape the officials who want him jailed and attempts to take over the country pretending to be the Duke of Aldoria. In the process, he is captured by some rebels who promise not to kill him and give him 12 million francs if he allows for free elections in Aldoria. Blackie now sees a double out. He can pose as the Duke, promise free elections, lose and become ousted and live happily on the money in France. In the process of trying to convince the officials the real Duke is the fake, Blackie is found out only because of a scar the Duke has and Blackie does not. He is then jailed. Thinking the twin feature of Blackie a bonus the officials of Aldoria decide to use him as a body double so the real Duke cannot be assassinated. The Duke of Aldoria is a drunken womanizer who has no love for his citizenry, the people know this and a revolt is just waiting to happen. While Blackie is in jail someone mysteriously sends him books, fine wine and food and doctors to ensure his good health. He later finds out it is a Countess of Aldoria and works her into another scheme to help him escape. Blackie’s first showing is for the dedication of a bridge. The parade to the bridge is rife with revolution, someone throws a cheap wine bottle at the carriage, making fun of the drunken Duke, in which Blackie orders the guards not to kill the man, but instead shares the wine with the man. An assassination attempt is made in which a grenade is thrown at Blackie, heroically he catches the grenade and throws it back. At the dedication hecklers in the audience, placed by the rebels who made the bargain for the elections, begin asking about elections. Blackie then announces that free elections will be held in a month. Blackie must now campaign for the Duke, at this point he makes a wager with the Countess that if he wins she must marry him. Can he persuade a country that is already teetering on revolt to elect him as their leader? Hubbard has written an adventure which provides a fun look at mistaken identity, entertains with a tale of intrigue and throws in some humor and romance that will leave you guessing what will happen next until the very end. As with all the Galaxy Audio productions this audiobook delivers the story that will remind you of the golden age of radio when dramas were told with excellent voice actors, great sound effects and a musical score that will transport you back in time on an adventure not to be forgotten. It’s time once again to go on a far flung adventure with L. Ron Hubbard and stories from the Golden Age. In the middle of the 20th century Hubbard wrote numerous stories that were published in the various pulp fiction magazines of the time. He wrote science-fiction, fantasy, westerns, war stories and sea & air adventures, and adventures from afar. This time around Galaxy Audio/Galaxy Press have put together their own Hubbard pulp fiction/audio pulp fiction that covers the world from the Arabian sea to Russia to the West Indies. As with any well written story these stories will sweep you away and take you to these lands and leave you on the edge of your seat the whole way. This is especially true if you give the audiobooks a listen. The audiobooks are produced with excellent voice acting consisting of a great cast of voices, great sound effects that will create the theatre of the mind that was well known to those that listened to the old radio shows that used to be broadcast around the same time these stories were originally published, and the incidental music really gives you a feeling that you are on these journeys around the world. “Tomb of the Ten Thousand Dead,” originally published in October, 1936 tells of a search for the lost treasures of Baluchistan, an arid mountain region now part of Pakistan bordering the Arabian Sea, which leads to an ancient tomb, murder, and the obliteration of an entire expedition. Told in the first person by the pilot of the expedition, Captain Gordon, the only man to escape alive. Gordon is hired to fly a team of American anthropologists to the area and all goes well until an ancient map is discovered in an old pottery jar, revealing the site of a vast treasure that Alexander the Great was bringing to Greece from his conquest of India. At this point Gordon is discovered over the body of one of the anthropologists who has just been murdered. Gordon is not trusted by the leaders of the expedition and is forced to stay behind with the local guide while the rest follow the map. Gordon and the guide find the tomb where more than 10,000 of Alexander’s soldiers and camp followers lay buried in the high desert plains along with the loot of India—hidden in a tomb never to be reclaimed. Gordon must then fight for his life to escape with or without the treasure. “The Price of a Hat,” originally published March, 1936 tells of a A fur hat, a Kubanka, with a secret message stitched into its hatband costs the lives of six men in a belated effort to save the lives of Nicholas II, the last Russian Czar, and his family. “Starch and Stripes,” originally published January, 1936 is a story that has a bit of humor at the expense of the Marine Corps brass. A marine captain is trying to ensnare a dangerous rebel leader, but just when the Marines are closing in on the villain, top brass and U.S. senators decide to inspect the base and decide on future funding for the marines. Some great adventures to be had in this release from Galaxy Press.